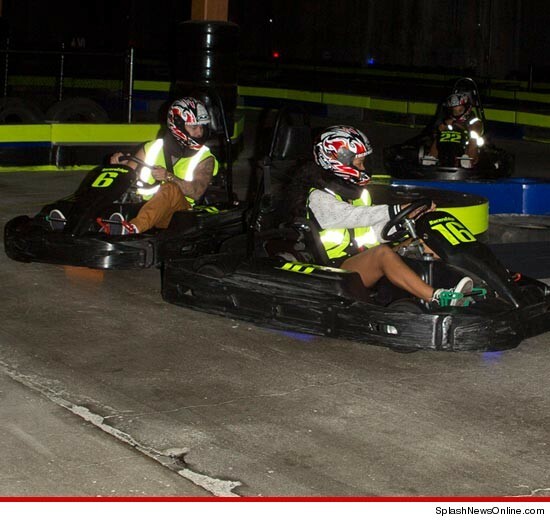 Rihanna and Rob Kardashian spent their entire Saturday together … going go-karting during the day..
and hitting up Playhouse in Hollywood at night..
It’s interesting … the two were rumored to have hooked up all the way back in February, but nothing has been mentioned about the would-be pair since. Rob is dating singer Rita Ora and the two recently got each other’s names tattooed on their hands. Ri Ri makes moves don’t she?? This entry was posted in Celebs, Entertainment News and tagged Rihanna, Rob Kardashian, TMZ. Bookmark the permalink.